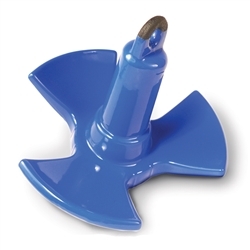 Greenfield Products River Anchors are designed for soft/moderate conditions for light/medium duty applications. They have a tri-fluke design which allows the flukes to penetrate the river bottom and catch and hold onto the bottom where rocks, structures and stumps are common. The anchors are all purpose anchors for lighter craft or as a second anchor for larger vessels. They are also ideal for pontoon boats and other difficult to hold boats.